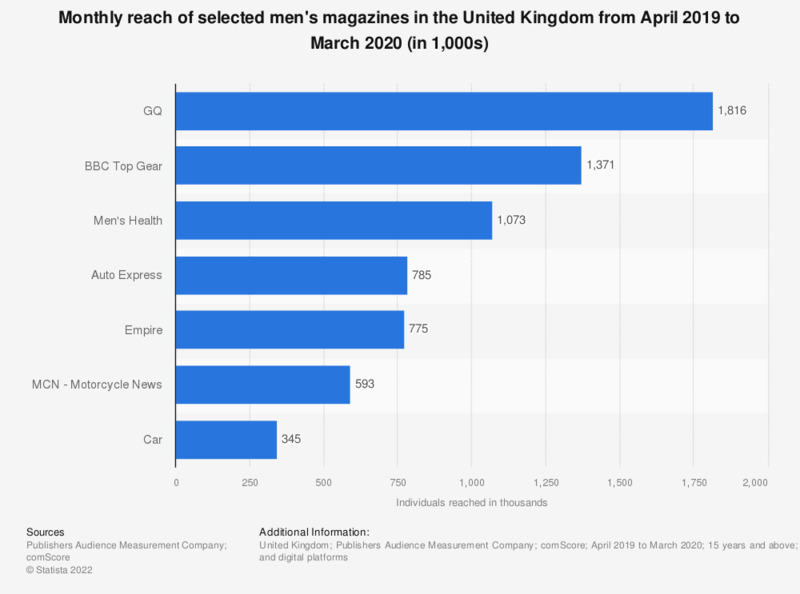 This statistic presents the monthly reach of selected men's magazines in the United Kingdom (UK) from January 2018 to December 2018. GQ had a monthly reach of 1.35 million individuals. Auto Express had the greatest reach of the magazines included here with an estimated 1.8 million reach. Auto Express was created in 1988 and is the leading magazine for automobile related information based on sales in the United Kingdom. The magazine is published on a weekly basis by Dennis Publishing. BBC Top Gear had the second highest monthly reach with roughly 1.5 million individuals. This magazine was introduced in 1993, and has a strong connection to the famous TV show spin off. Includes weekly and monthly titles.